Chien Khan negotiates with a demon lord named Noi Tai Dar. Khan offers the souls of all mankind to the hellspawn, as he seeks vengeance against humanity and wishes to see them destroyed. Noi Tai Dar states that if Chien Khan will open a doorway for him, he will see it done. To open the passage, Khan must sacrifice a life and the Warrior Dragon must unleash the power of the nuclear power plant. Meanwhile, the Dragon, under the control of Khan, begins to destroy the nuclear power plant. The TMNT attack their friend to try to stop him, to no avail. Ninjara is enraged when she discovers that the Warrior Dragon has been ordered to destroy the power plant – she is disgusted that Chien Khan would allow more radiation to foul Japan considering the bombing in 1945. Chien Khan prepares the young girl for sacrifice while the damaged nuclear power plant opens the gateway for the massive demon. The hellspawn attacks the Dragon, who comes to his senses after being blasted by a bolt of energy. The mighty Warrior is dismayed at what his actions have caused. Leo asks Ninjara what Chien Khan has planned, and she reveals that the summoning requires both a power source and a sacrifice. Apparently Khan hasn’t performed the sacrifice yet, as Noi Tai Dar is still tied to his power source – but once Khan completes his part of the ritual, the demon will be free to destroy all humanity. Leo determines that since the demon is too powerful for them to fight, they must stop Khan from making his sacrifice. Ninjara states that his headquarters are far from where they are, and Leonardo tells her that gives them all the more reason to hurry. Master Splinter stays in his meditative state, noting that the spirits are coming closer… behind him, two gigantic forms begin to appear in the sky… it’s none other than the gods, Izanagi and Izanami! Fu Sheng breaks free of his bounds and smashes into Chien Khan, preventing him from sacrificing the girl. Izanagi blasts Noi Tai Dar with a beam of light from his eyes and destroys the demon. Chien Khan’s helmet is knocked off by Fu Sheng’s attack – revealing Khan to be a dog-faced man! Chien punches a shocked Fu Sheng in the face and then returns to his sacrifice, but the TMNT and Ninjara arrive in time to stop him. Khan is livid and calls Ninjara a traitor before ordering his henchmen to kill our heroes – but the villains are no much for the Turtles and their new foxy ally. 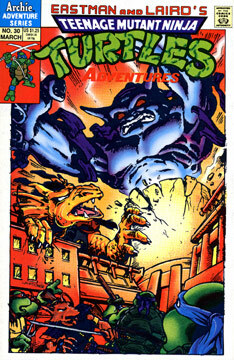 Suddenly, the roof of the building is ripped apart by the Warrior Dragon, who has returned to save his friend Fu Sheng. The old man is fine, but Chien uses the distraction to strike Ninjara and make his escape. Raph helps Ninjara to her feet, and everyone breathes a sigh of relief for another hard fought victory.